30+ years ago, a group of community leaders came together with a dream – to nurture the cultural “heart and soul” of Collingwood by founding a non-profit summer theatre company. They envisioned a vibrant, well-rounded community, enlivened and connected by arts and culture. Theatre Collingwood has come a long way since then, but our mission remains the same: to enrich and entertain the community by presenting and producing live professional theatre. We are now a year-round theatre company, with charitable status (enabling us to provide tax receipts). While most of our theatre patrons live in the region, many are visitors from across the province, the country, and the world! We also provide drama education for youth, and we are especially proud of our outreach program for youth who may have financial barriers to such programs. 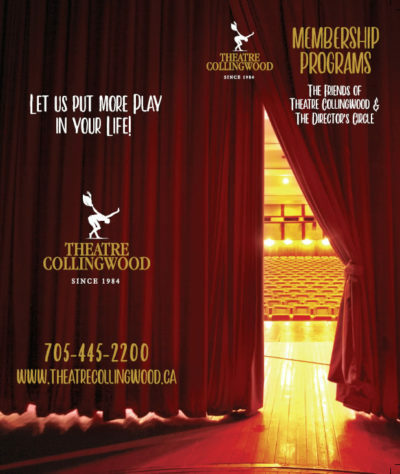 Theatre Collingwood is dedicated to showcasing the finest talent in quality productions. We strive to work independently as well as together with other local and regional theatre companies and independent artists. It is our belief that we are nothing if we are not part of a larger picture, and it is of utmost importance to us that we create an environment for the community and for Canadian artists to come together. Not everyone will love everything we do, but we sincerely strive to present shows that will entertain and, perhaps, start a conversation. For those who have applauded the work of Theatre Collingwood since the beginning, and those who have more recently joined our audience, thank you for your support. It is greatly appreciated. Ticket sales and other earned revenue cover roughly 50% of our production/operating costs each year. Theatre Collingwood relies on the support of individuals, corporations, foundations and grants to bridge the gap and enable us to remain vibrant and dynamic. YOU can make a big difference by becoming a Member today. There are Membership levels to fit everyone’s comfort zone, and no donation is too small. We believe we have created a very exciting Membership program, with each level providing specific benefits for you as our way of saying thank-you. If you have been a Member in the past perhaps now may be the time that you could increase your personal investment in Theatre Collingwood? 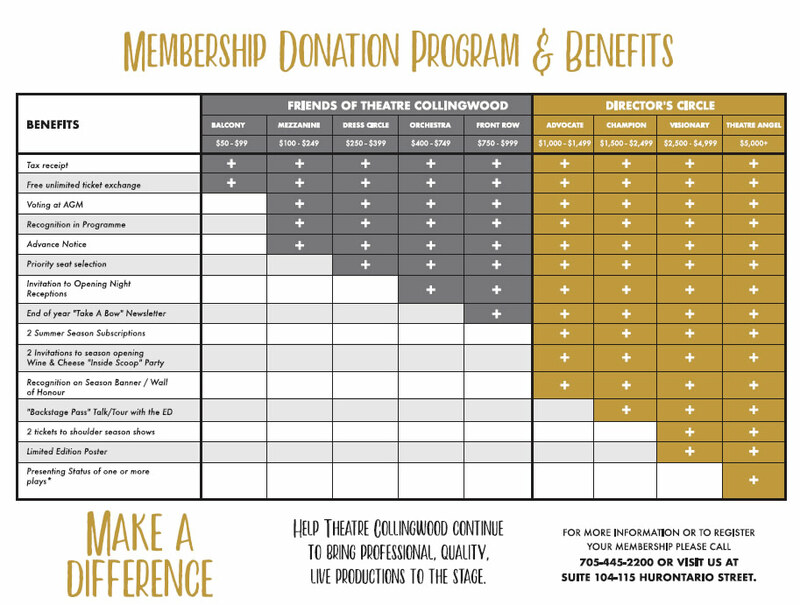 Make a difference and help Theatre Collingwood continue to bring professional, quality, live productions to the stage. For more information or to register your Membership please call 705-445-2200 or visit us at Suite 104-115 Hurontario Street, Collingwood.